Wood floor enthusiasts often opt for the durability and strength of veneer flooring that lets them showcase a particular wood without the expense of solid wood flooring. But producers and consumers both need to know that the wood veneering process can literally be a moisture content (MC) trap. An integral wood veneer manufacturing process still requires some form of wood moisture management in order to succeed. Manufacturers apply wood moisture meter assessment throughout the wood milling process to ensure that wood MC has balanced within the wood and with the relative humidity (RH) of its ambient environment. Put simply, equilibrium moisture content (EMC) is how manufacturers ensure that a veneer floor stays straight and lasts long. Every piece of wood, no matter how it is used or manufactured, must reach EMC to meet performance standards and expectations. Now apply this core knowledge to the floor manufacturing process. Veneer layers have their own MC, as does every layer of wood added during the manufacturing process. In the event that producers use layers of different wood species, the MC imperative is even greater. Each wood layer (even equilibrated) responds differently to changes in RH. Add the chemical and MC of industrial wood glues, and one gets a clear sense of the challenge to produce outstanding wood veneer flooring. Producers will often cross-layer between eight and ten wood planks over the substrate, with glue, and then hot-press all of it into one floorboard. The cross-layering means that grains run perpendicular to each other, limiting the amount of flex each layer can have if moisture conditions change. Why use a wood moisture meter at this stage? Because the water vapor held within each and every cell of each and every layer pressed into that floorboard can absorb and release MC according to changes in RH. This remains true even after the wood has equilibrated. And in between each layer of the wood sandwich, adhesives have their own MC and chemicals which interact with the wood layers. Of course, wood MC changes with moisture spills and even the changing of seasons. But well-manufactured and installed veneer wood floors need not be a source of continuous consumer fears, as long as manufacturers, installers and owners understand the ongoing dynamic of wood moisture. Assessing MC with a wood moisture meter helps to alleviate those concerns. Flooring owners can benefit from knowing not only the type of veneer used on the top layer but also the subsurface material used to manufacture their veneer wood floors. If the woods used all have a relatively similar specific gravity, they will generally perform better than those with divergent specific gravities. Wood species contain various densities, and this becomes exponentially true if the veneer wood flooring contains several different species. The first key to understanding wood behavior is to learn the wood species of the substrate, planks and veneers. It also pays to select a wood moisture meter for measuring the MC in veneer flooring applications. 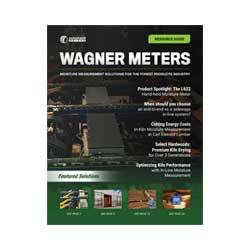 Wagner Meters features non-invasive wood moisture assessment tools to cope with the challenges posed by veneer wood flooring. Non-invasive meters measure the MC quickly, easily and without damage to the flooring. It pays to invest in a good wood moisture meter for veneered wood flooring applications to assure that the flooring will perform as beautifully as it looks.